"Being part of the history" - this affects not only many companies, but also their stocks and bonds. But, especially the latter don't make us forget: Old stocks and bonds tell us stories which couldn't be more exciting. They take us back on a kind of journey back in time. We offer you to to join us on the journey back in time. Your benefit: Our magazine is completely FREE OF CHARGE! 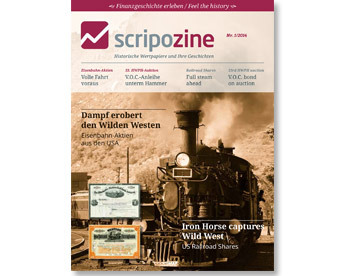 Here you can subscribe to Scripozine for free. Simply type your email address into the field and click the "Subscribe" button. You will receive an automatically generated email with a confirmation link. Please use this link to finally confirm your subscription.